Have you ever wondered that Lamb Brand also have Vanilla Powder, Bicarbonate of Soda and Cream of Tartar as part of their range or products? 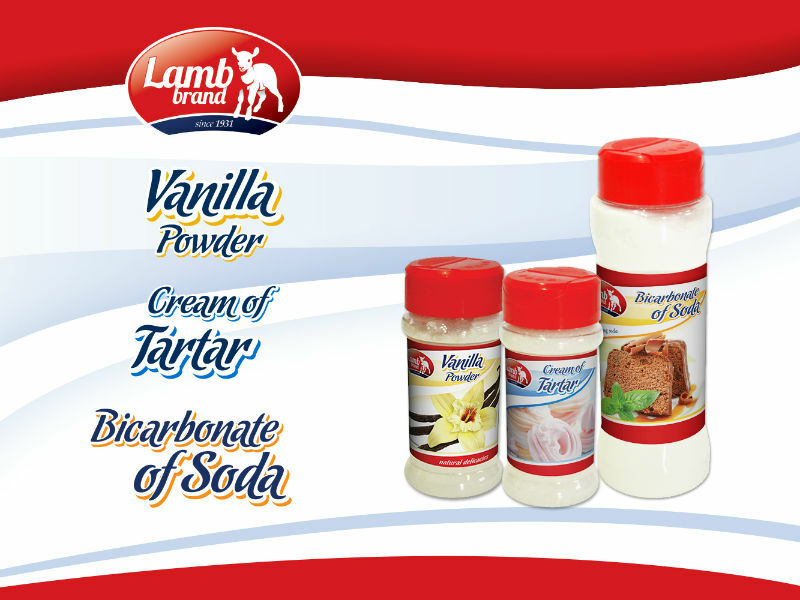 Lamb Brand Vanilla Powder and Lamb Brand Cream of Tartar are are quite new on the market while we gave a revamp to Lamb Brand Bicarbonate of Soda. We are giving you a brief overview and some tips, of how these ingredients can be useful in your kitchen! Beautifully fragrant powder made from the whole vanilla pod. Vanilla powder adds more flavour to your baked goods than the ordinary vanilla extract. It can be sprinkled on fresh fruit or toast, and added to coffee or oatmeal. When cooking or baking, vanilla powder easily mixes with liquids without lumping and adds flavour to breads, cakes, cookies, frostings, and meringues, as well as ice cream and custards. Vanilla powder offers unique and useful properties that home cooks will appreciate. There is no sugar or alcohol and it dissolves quickly in hot or cold liquids. Cream of tartar is mostly used for baking and has nothing to do with Tartar Sauce (the mayonnaise based sauce that is served alongside fish). Cream of tartar is a white odourless powder which is formed from the sediment left over in barrels after the wine making process. Cream of tartar is best known for helping stabilize and give more volume to beaten egg whites and whipped cream. A pinch of cream of tartar added while the whites are being whipped will strengthen the matrix of bubbles and help prevent the egg foam from collapsing too quickly. Cream of tartar is also used to inhibit crystallisation in the production of sugar candy. The tartar also helps to increase the volume of the egg foam and keeps them bright and white. It can also be used to make simple baking powder by using 1 part bicarbonate of soda to 2 parts cream of tartar. Bicarbonate of Soda, also know as Baking Soda, is a fine white powder, which is primarily used in baking. It is used to raise soda breads and full-flavoured cakes such as gingerbread, fruit cake, chocolate cake and carrot cake. Bicarbonate of soda also helps to neutralise the acid in tomato sauces leaving your favourite sauce not only tasty, but easy on the stomach. Bicarbonate of Soda also acts as a gentle cleanser to wash pesticides off your fruit and vegetables. It is a natural deodorising chemical to remove bad odours from the environment, such as refrigerators and other places in you home. Adding extra bicarbonate of soda can result to strong unpleasant flavours and peaked or collapsed cakes.